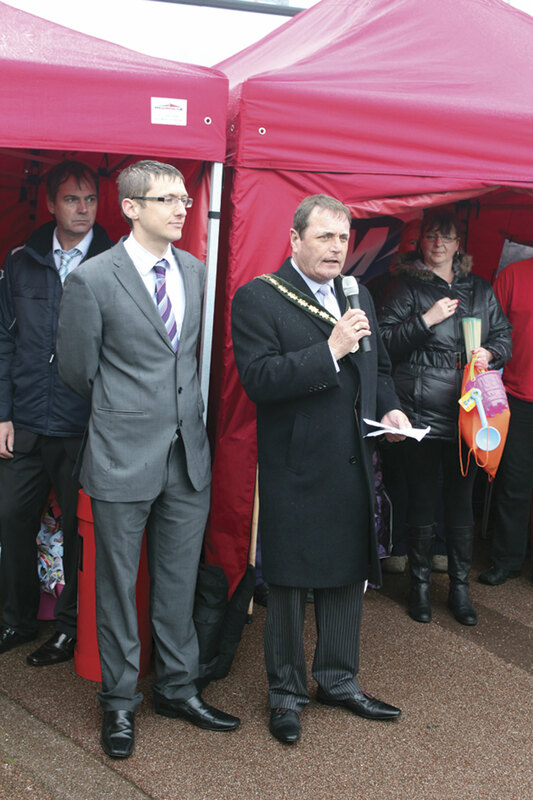 Despite weather that was more bracing and less hospitable than might have been hoped, the launch was strongly child focused and attracted a good crowd of potential customers along with their parents. To keep them entertained there was lots to do with a spin the wheel attraction enabling children to win a goody bag in colours matching one of the five characters, with character specific sticks of rock, colouring books and pencils and a booklet with details of the service and the attractions on it. In the bag were there was also a card with a badge of one of the five characters and spaces where badges that can be collected by riding on the other buses can be mounted. There was a Rocky cake to be enjoyed, Seasiders windmills (so much easier to control and longer lasting than balloons), music from the local Lincs FM 102.2 radio station and the talented children’s entertainer and magician, Mr Shiney. The relaunch comes at a particularly important time for the resort amid fears from members of the local Chamber of Trade that schools introducing fines for parents taking their children out of school will mean a further shortening of a season that is already brief. 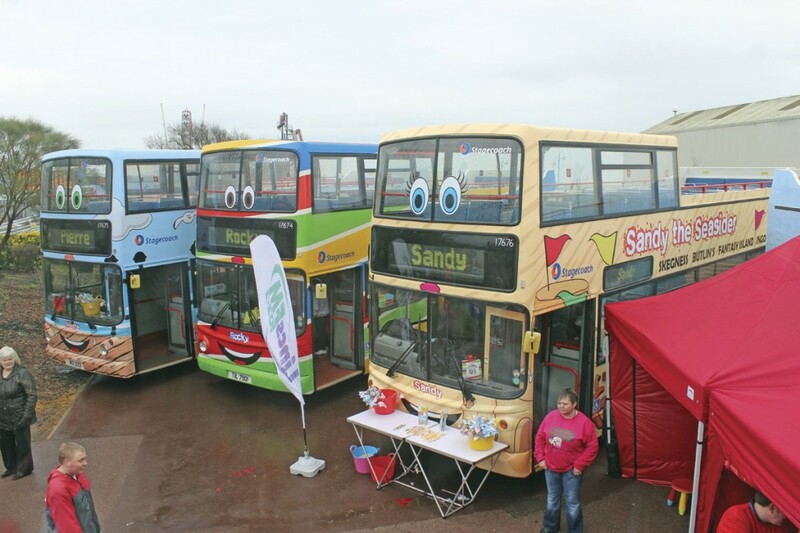 The 3 service between Skegness and Ingoldmells via Butlins and Fantasy Island operates from 5 April to 2 November, with high season running from 24 May to 31 August. Michelle told B&CB, ‘Skegness is a lovely place. I’m a Lancashire girl and this is so much cleaner and more child friendly.’ She explained that the company had met with the Chamber of Trade, local retailers and Butlins and made a presentation on the proposals which were welcomed very much. 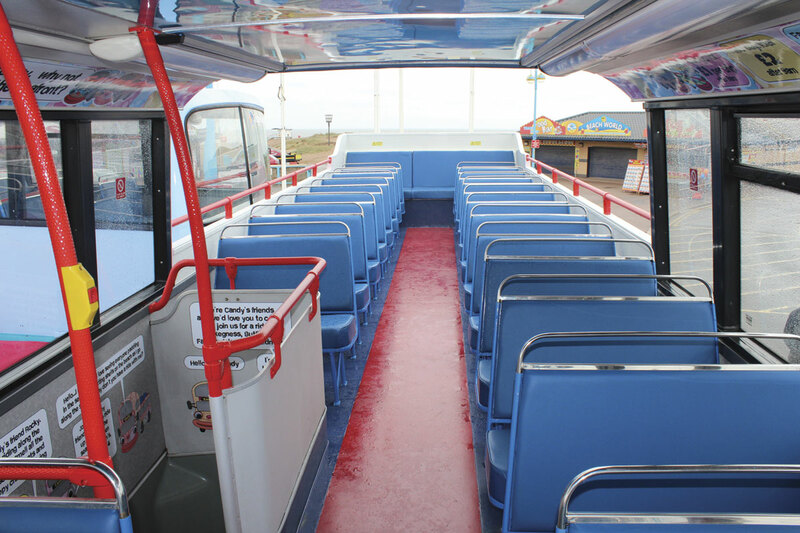 The company had worked with them in the development of the ‘Skegness Coastal Guide to Ingoldmells, Chapel and Mablethorpe’ which not only included all of the relevant bus details but also information on attractions and vouchers giving money off entry to them. As part of the initiative, a new children’s book entitled ‘Rocky the Seasider saves Teddy’s holiday’ has been written by Stagecoach East Midlands’ Michael Sanderson and illustrated by Emily Snape. It is being sold at £2.00 a copy with the proceeds going to the ‘When You Wish Upon A Star’ charity for sick children. 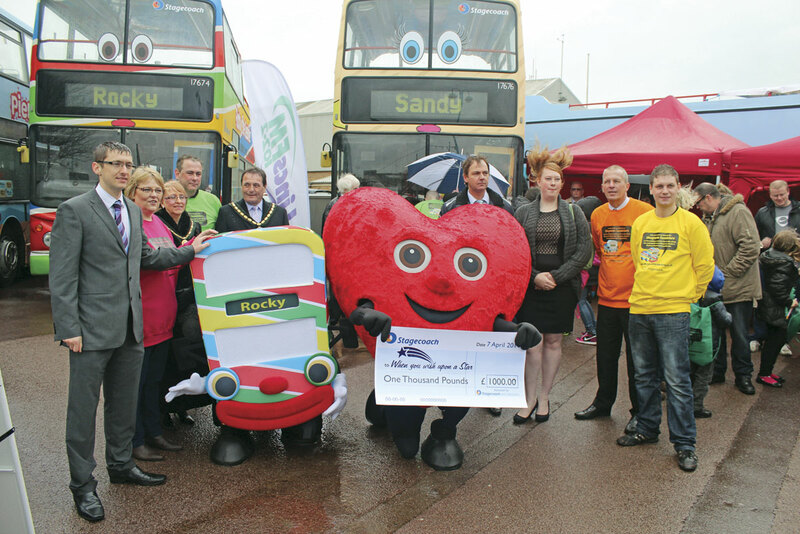 One of the organisation’s fundraisers, Gemma Summerfield, was present at the launch to collect a cheque for £1,000 on behalf of the charity. 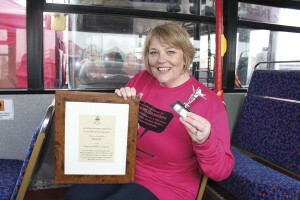 She explained that the charity grants wishes to life threatened and terminally ill children of between 2 to 16 and the money raised would go towards projects including a Harry Potter themed trip on the Northern Belle to Alnwick Castle in Northumberland. In addition to the five open toppers fully liveried and with character names, there was a sixth present with no names or adornment on a two tone blue livery base. 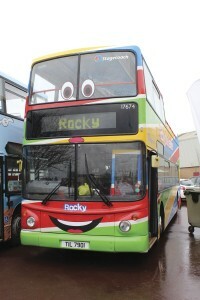 Children were being invited to design their own livery for the bus using a pre-printed image as their base. 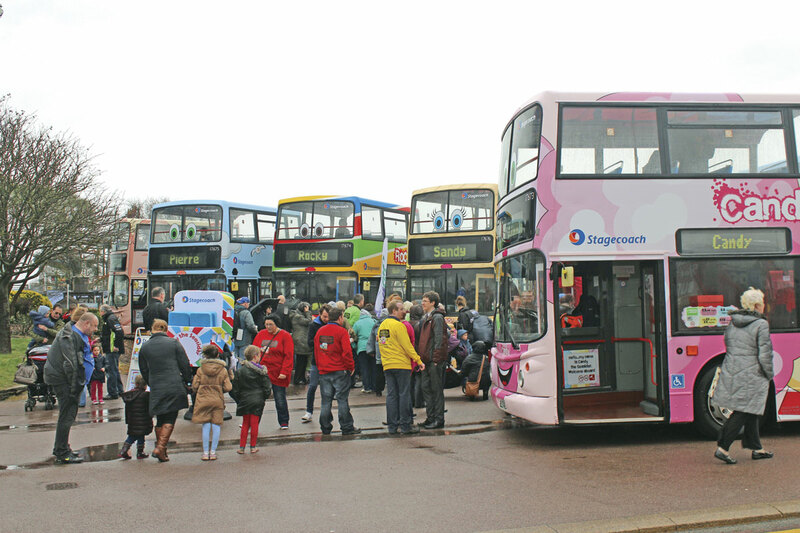 The best entry received by 14 April will have their design applied to the exterior of the sixth bus which will also then be named. 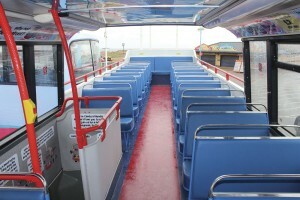 The vehicles themselves, which are the same low floor Tridents that replaced MCW Metrobuses on the work five years ago, feature newly moquette trimmed seats on the lower deck and e-leather trimmed seats on the upper deck and have received attention to their floors in addition to repainting. 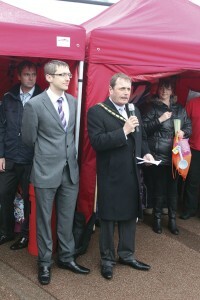 Recognition of the efforts put in by the Lincoln based painting team saw them invited to participate in the launch event. Michelle revealed that great lengths had been gone to in ensuring that the new look did not appear on social media sites before the launch. When the painted buses needed moving, it was done in the middle of the night. Marking the Mayor’s thanks for Stagecoach’s support during his Mayoral Year as well as its efforts on behalf of his chosen charities, Michelle Hargreaves was presented with a mounted mayoral scroll and a silver Jolly Fisherman statue by the Lord Mayor. 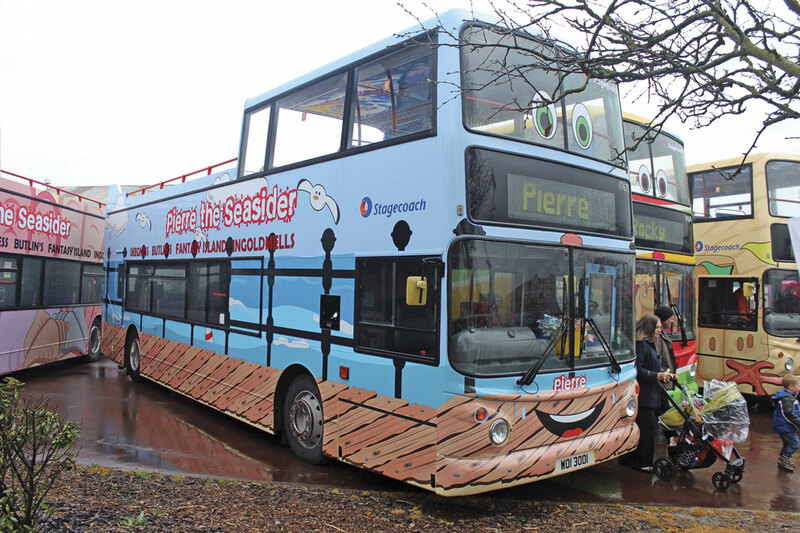 The imaginative Seasiders initiative is only one that the company has introduced under the auspices of Stagecoach East Midlands Managing Director, Michelle Hargreaves, who took up the role last July, having previously headed up Stagecoach South West. Another that is already paying dividends with ridership up on average 9-15% since the launch on February 14, is the ‘Love your X’ on the X62 service. This local bus service links Hull and Leeds via the M62 motorway using wi-fi equipped e-leather trimmed Plaxton Profile coaches rather than the previous double deckers. The fare is £7.00 end to end or £12.00 return. The route has its own www.loveyourx.co.uk website.